Linear agar/media filler for most ergonomic work. The PS900 can fill Up to 900 Petri dishes per hour (15ml/plate). Petri dishes move from station to station: stacking unit - high sterility filling chamber - media smoothing - to the adjustable height stacking area. Neutec Group is proud to offer innovative agar plate filler systems by Biotool Swiss. This new series of fillers offers the state of the art agar filling technology and include: changeable dish height stacking, and touch screen. This system was designed to be a much more flexible and reliable versus carrousel fillers. The units are user friendly and engineered for batch, or continuous operation with minimal down time. 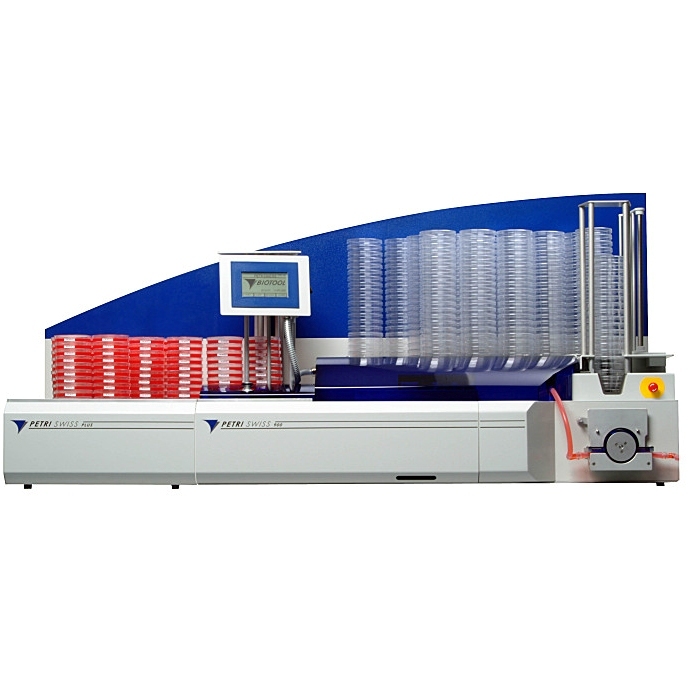 The PS900 linear filler can fill Up to 900 plates per hour capacity (15ml per plate) ! The Petri dish is transported from station to station. Feeding and filling in decontamination chamber, media smoothing, stacking with stacking heights inter- changeable options which are determined by the operator. The PS900 can be connected to an external Ink Jet that will print on the dish information such as sample ID, batch number, date or a barcode. The unit will need to be pre-ordered from the factory as "printer ready" and we will be happy to connect you to the local InkJet dealer who can offer you the printer itself and supplies. BioTool’s Media Preparators Proficlave PC10 and PC20 Sterilizer prepares up to 9 and 16 liters of plain or complex vitamin / blood added agar formulations, easier and faster than ever. 47.24 x 28 x 23.62 inch 1200x710x600 mm. 70.86 x 30.31x 23.62 inch 1800x770x600 mm. Delivery Rate 600 ml. / min. Dish Quantity on Discharge Table 500 ea. I just wanted to take a minute to tell you how much The Georgia Poultry loves our Petri Swiss 900. After years of battling with the Carousal pourer it’s amazing how simple getting twice as much work done in a much shorter time has become. Also I would really like to thank Luc - our Neutec Service Engineer for always doing such a great job taking care of our machine. He is one of the most knowledgeable and gracious young men I’ve seen in a long time. What a great asset for us all. Thanks again.